Choosing a kitchen countertop isn’t all about looks! Durability, maintenance and cost are all factors. If you select a favorite and it doesn’t fit your lifestyle, chances are that there is a similar style in another material that will work. However, regardless of whether it is granite or concrete, you must care for it appropriately to maintain its beauty. According to the National Kitchen and Bath Association, granite is the top choice in kitchen countertops. It is available in a wide variety of colors and no two pieces are ever exactly alike. Granite can be polished to darken and shine the stone or honed to make it soft and matte. Similar natural stone materials, like marble and limestone, are softer than granite and require more delicate use. Quartz, a combination of mineral, color, and resin, is not cheaper than natural countertops, but is a durability superstar. Hot pots, serrated knives, abrasive pads, and most stains are no match for quartz. All natural stone countertops must be sealed periodically to keep them looking great, but quartz does not require sealing. Concrete countertops are gaining popularity because they can be completely customized with pigments. Concrete is available in several different finishes: trowel (smooth), ground (sanded to expose the sand aggregate) and pressed (a tool is used to reveal marble-like veining). 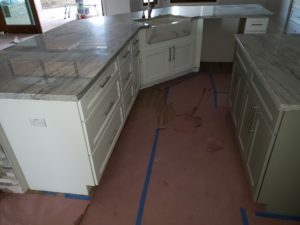 Extreme changes in temperature may cause concrete to warp or curl, damp sponges left on the countertop can cause discoloration, and acidic spills may mar the surface. To keep concrete countertops in shape, seal them four times per year and wax them with a paste every two to three months. Wood countertops, like butcher block, instantly warm up a kitchen. They are easy to clean and scratches can be sanded out. Nevertheless, water damages wood countertops easily, so they must be oiled frequently to seal the surface. Varnish improves stain resistance. A similar look is available with laminate, the most affordable countertop material on the market, but laminate can scorch if a hot pan touches the surface and it has a reputation for scratching easily. Mix and match or choose unusual, cutting edge materials like stainless steel, concrete, zinc, recycled glass, and copper. Regardless of the type of countertop you select, Cornerstone Cabinet Company can create a kitchen concept for lasting satisfaction.